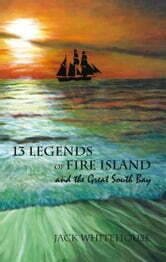 Here are stories about Fire Islands pirates, ghosts, shipwrecks and treasure chests of buried gold and silver. One tale relates the story of the possibility of the Viking discovery of Fire Island; another describes the torture of the islands slave trade prison. There is a story of unrequited love in the smoldering aftermath of an important Revolutionary War battle and another of German submarine saboteurs of World War II. If you like horror and suspense, history and mystery, or if you simply enjoy Fire Island and the Great South Bay and want to take home a piece of it home with you, then you will love this anthology. These stories will kindle your interest in visiting new beach locations and spur your imagination with thoughts of what was, and what might well have been. Even if you have never visited the area before, these tales of universal human experience are bound to fascinate. You are certain to want to share 13 Legends of Fire Island and the Great South Bay with friends, after you can put it down, that is.